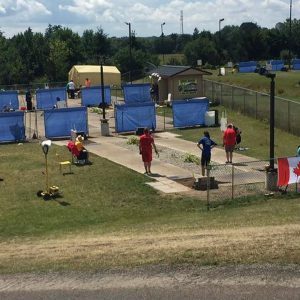 The 2017 Canadian Horseshoe Pitching Championships were held from August 8-12 at the Guelph Royal Canadian Legion, in Ontario. 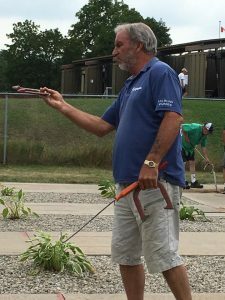 The Guelph horseshoe club (Royal City Ringers) was hosting the event for the first time, under the leadership of Hall of Famer Tom Gallina. 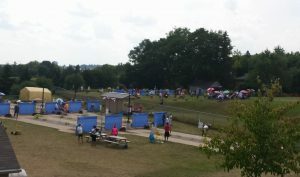 All play was held outdoors on 24 courts, and the weather was cooperative as only the Friday night shift had to be postponed due to severe thunder storms. 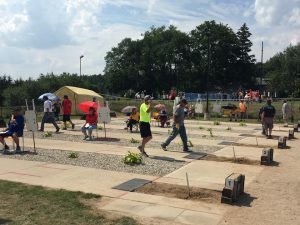 There were a total of 225 entries from 7 provinces, from coast to coast. They were represented as follows: Ontario (121), Quebec (53), Saskatchewan (15), Alberta (12), New Brunswick (10), B.C. 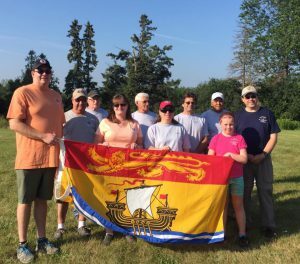 (8), Nova Scotia (6). In the Juniors, Cedryk Weightman retained his title, being crowned for the third consecutive year. Besides plyaing with the Women’s A, Cedryk defeated Mike Marshall in a best of three for the Junior Boy’s title. Cedryk maintained an average of 60%. 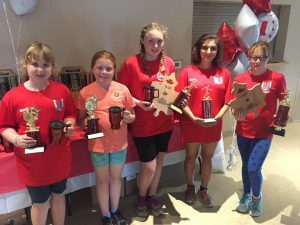 Sarah Nooren was crowned Junior Girls champion, while Emma Calhoun was declared Cadets (PeeWee) champion. In the Women’s division, Sylvianne Moisan won her 19th Canadian title in that division but it was very tough. 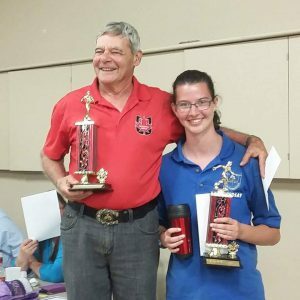 During the quintuple round-robin, she trailed by two wins with 3 rounds to go behind the young Lindsay Hodgins. But the leader lost 35-42 in 76 shoes against Lyne Pineault (73.6%) during round #13, and then Sylvianne defeated Lindsay 41-37 during the last round (#15) to create a tie and force a playoff. The tie-breaker was to be the longest game of the tournament at 78 shoes. With the score 38-37 in favor of Lindsay, Sylvianne had to throw 4 consecutive doubles to finally win 40-38, after 3 straight fourdeads. Lindsay shot 73% during that game to Sylvianne’s 71.7%. Lindsay recorded the high games of the group with 86.9% and high overall average of all the participants in the championships with 73.13%. In the Men’s division, Colin Finnie retained his title which is his 12th overall. He defeated the tournament leader Drew Becker in the key and pivotal next-to-last round match 42-36 with 70.8%. Drew then lost the last round game to Martin Provencher, preventing a playoff game and possible revenge. Former champion Duncan MacKenzie, from Nova Scotia, finished third. The high game of the group was 75% achieved by two players: Adam Ellis and rookie Martin Provencher. 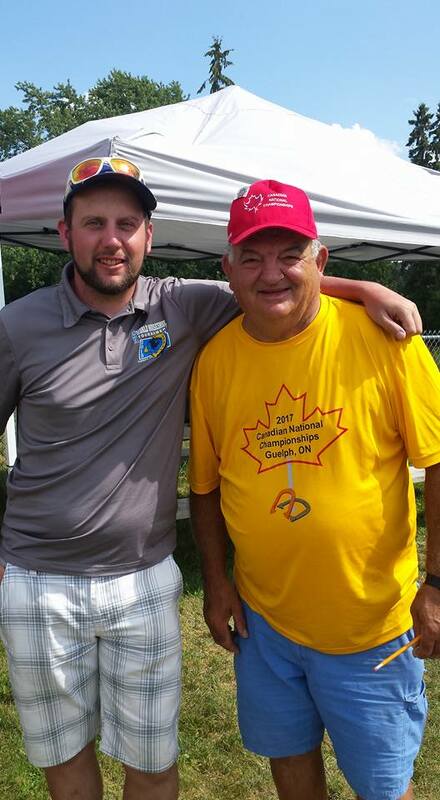 The longest game was 80 shoes between Dan Gagnon and Andre Leclerc during the 5th round. 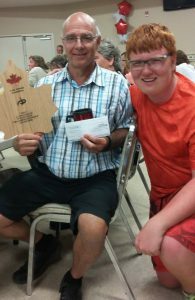 In the Elders division, the Quebec players dominated, filling the podium in the A class won by Jean-Guy Trudel (70.05%). 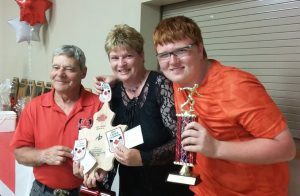 He pitched his second highest game (79%) during the last round against runner-up Jean Kenney with the title being decided by the winner of that game. 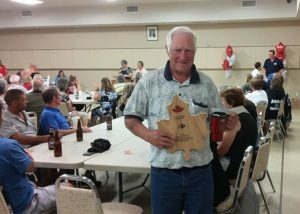 Leo-Paul Provencher took third place. Jean recorded the high game of the group with 86.6%. The championship week started with a meet & greet with typical italian cuisine, followed by Horseshoe Canada’s Annual General Meeting on Tuesday August 8th. The competition was launched the next day with the opening ceremonies. 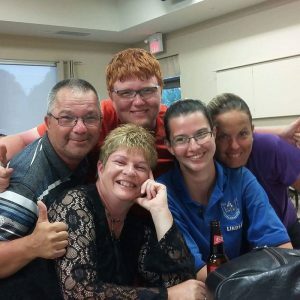 Among the presentations at the Banquet held on Saturday night at the Legion, the late Bernice Busch was inducted into the Horseshoe Canada Hall of Fame as an outstanding female player. 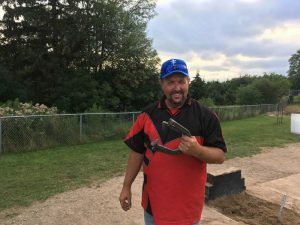 Greg Toneguzzo (son of Bruno) donated $500 to be split $250 each for the top male and female ringer average only for the complete tournament with a trophy each to boot. 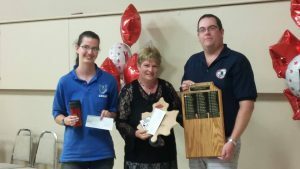 The special prizes went to Jean-Guy Trudel and Lindsay Hodgins. 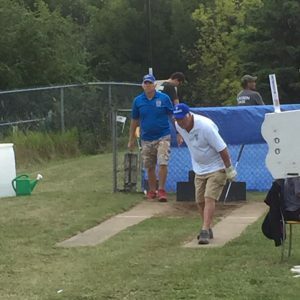 The 2018 Championships will be held from August 15-18 in Whitewood, Saskatchewan. 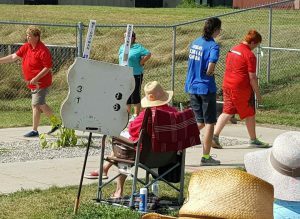 Thanks to Horseshoe Canada, the participants, our hosts, their sponsors and volunteers for another great event! Thank you Guelph for your hospitality and great tournament! 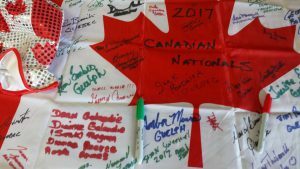 Participants signatures on Canadian flag. New Brunswick delegation at the opening ceremonies. 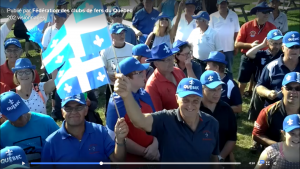 Part of the large Quebec contingent at the opening ceremonies. 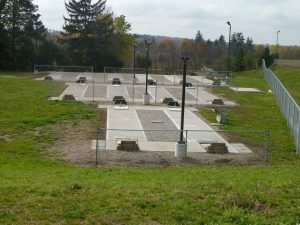 Overall view of the courts. 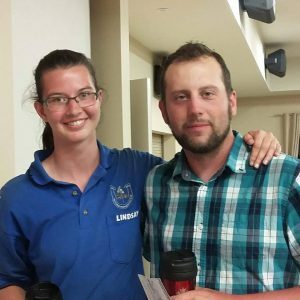 High overall average awards: Jean-Guy Trudel and Lindsay Hodgins. Ladies A at the banquet with Jason Rideout. Ladies A group at the banquet. Three division champions: Jean-Guy, Sylvianne and Cedryk. Lindsay Hodgins and Drew Becker – runners-up.